Rabinowitch, I., Treinin, M. and Bai, J. (2016). Artificial Optogenetic TRN Stimulation of C. elegans. Bio-protocol 6(20): e1966. DOI: 10.21769/BioProtoc.1966. Optogenetics is a powerful tool for manipulating neuronal activity with high temporal and spatial precision. In the nematode C. elegans optogentics is especially useful and easy to apply. This is because C. elegans is translucent, so its neurons are highly accessible to optic stimulation. In addition, many of its neurons can be exclusively targeted using cell-specific promoters. We have recently taken advantage of optogenetics to deliver artificial patterns of prolonged activation to a class of mechanosensory neurons, called touch receptor neurons (TRNs) in worms that lack touch sensation due to a genetic mutation. Our aim was to examine whether we can counteract the effects of sensory loss by artificially activating the sensory neurons. Here we describe in detail the various components of the protocol that we used. This consists of exposing worms expressing the light-sensitive ion channel Channelrohdopsin 2 (ChR2) in TRNs to long-term random flashes of light. Artificial optogenetic stimulation (or silencing) of neurons has become of broad use in neuroscientific research. The powerful model organism, C. elegans, is particularly amenable to optogenetic manipulation (Nagel et al., 2005), and multiple groups have developed a range of techniques for delivering artificial brief patterns of stimulation with high temporal and spatial precision (Leifer et al., 2011; Stirman et al., 2011) and in combination with behavioral (Kocabas et al., 2012) and calcium imaging (Guo et al., 2009) or electrophysiological (Lindsay et al., 2011) readouts. We were interested in establishing a long-term stimulation protocol that would substitute natural ongoing activity in mechanosensory neurons deprived of sensory input (Rabinowitch et al., 2016). Our protocol integrates previous C. elegans optogenetic protocols, but focuses on chronic rather than transient stimulation. The second strain combines both defective TRN mechanosensation and ChannelRhodopsin 2 (ChR2) expressed exclusively in the TRNs. Importantly, while examining several TRN-specific ChR2 strains (all using the mec-4 promoter), we observed in some of them abnormal mechanosensation and locomotion even in a wild-type background. In contrast, ljIs111 exhibited normal behavior and mechanosensory responses. Strains are grown and maintained under standard conditions (http://www.wormbook.org/chapters/www_strainmaintain/strainmaintain.html) at 20 °C on nematode growth medium (NGM) 2% agar cultivation plates seeded with Escherichia coli strain OP50. All experiments are conducted at 18-22 °C. We found that higher temperatures considerably alter the results. Tested worms are adults around 24 h after the L4 stage. C. elegans does not produce the co-factor all-trans retinal (ATR), necessary for ChR2 function. However, ATR can be incorporated through feeding (Nagel et al., 2005). ATR is first diluted in ethanol to 100 mM in a 1.7 ml tube. The tube is wrapped with aluminum foil to avoid light exposure and is stored at -20 °C. Prior to seeding the ATR plates, 5 μl of the 100 mM ATR stock solution is added to 1 ml OP50 bacteria suspended in LB and the tube is gently vortexed. Then 100 μl of the ATR OP50 mix is applied to 6-cm cultivation plates and to 3-cm stimulation plates, each containing nematode growth medium (NGM). Once seeded, the plates are kept in the dark. The plates can be used the next day. ChR2-expressing worms are grown in the dark on the 6-cm ATR cultivation plates. As a control, a second cohort of worms can be grown under similar conditions, but without the ATR. Figure 1. Optical stimulation apparatus. A. LED assembly and beam optic. White arrows point towards soldering points. B. LED assembly mounted to the top of an opaque cardboard box. C. Hook-up wires from the LED assembly (black arrowhead) connected to the digital output of an Arduino Uno microcontroller board. In the picture the Arduino board is not connected to the computer. Note: Two pieces of hook-up wire are soldered to the LED assembly to drive current through it. 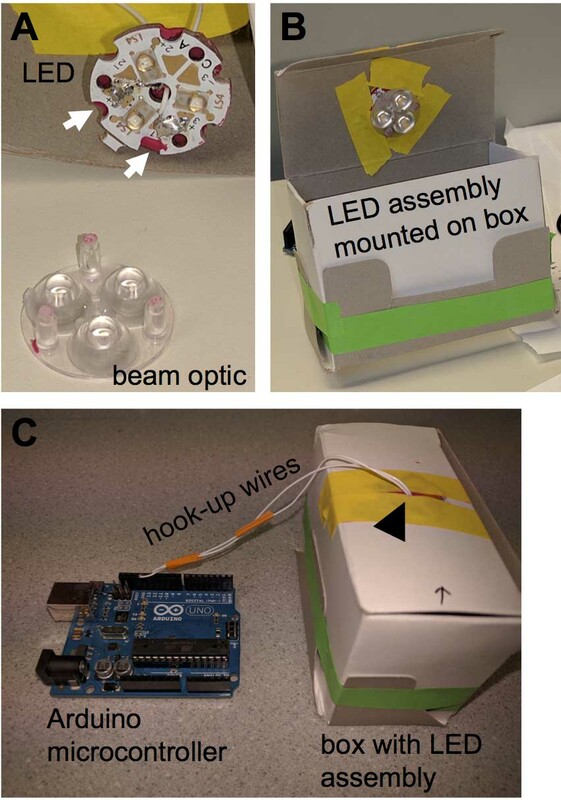 The LED assembly is attached to the circular beam optic and together they are mounted to the top of the opaque cardboard box. The LED is connected to an Arduino Uno R3 microcontroller. One wire is attached to the ground and the other to digital output number 12. Figure 1 illustrates the apparatus. The Arduino microcontroller is connected to the computer via USB cable. Note: Available for free online. Custom written Matlab script called Led3.m, provided as an appendix. In the Led3.m script, configuration ‘Poisson4’ is used to deliver random flashes of blue light for approximately 80 min each session, producing prolonged stimulation. The interval between flashes is drawn from an exponential random distribution with a 10 sec mean. The duration of each flash is drawn from a uniform distribution with a 3 sec mean. Prior to blue light stimulation, 10 worms are transferred from the 6-cm cultivation plate to a 3-cm seeded stimulation plate including ATR. The lid of the plate is removed (so that it does not interfere with the light) and the plate is placed inside the optical stimulation box. Then stimulation is started by running the Led3.m Matlab script. In our application, we were interested in examining the effects of prolonged artificial TRN stimulation on subsequent locomotion patterns of mechanosensory mutants. Since we found that loss of body mechanosensation leads to an enhanced reversing frequency when the worms are removed from their source of food, we tested reversing frequency after artificial TRN stimulation to see if it decreases back towards wild-type levels (Rabinowitch et al., 2016). In each testing round, four to six worms of each genotype are picked from the 3-cm stimulation plate either immediately, after no flashing at all or 2 h after the end of the flashing session, and their reversing rate off food is measured. The assay is repeated on at least three different testing days, and in each testing day all genotypes are equally represented. The reversing assay is based on a well-established protocol (e.g., Tsalik and Hobert, 2003). Each worm is first transferred to an area in the plate that is free of food in order to release bacterial remainders from its body. As soon as there is no visible trail of food, the worm is placed on a 6-cm unseeded NGM test plate. Prior to the assay, the test plate is left for 1 h with its lid off to dry its surface. 1 min after transferring the worm to the test plate, the number of reversal events is counted over a duration of 3 min. A reversal was counted only if it consisted of at least two consecutive head bends while the worm reversed. Note: We observed an effect only 2 h after the end of the light stimulation. Each experiment is performed on at least 3 separate days, with a similar number of repetitions per day. Mean reversing frequency (number of reversals per minute) is calculated by dividing the number of reversal events by 3 min. In experiments in which a 2 x 2 design is applied (e.g., no stimulation versus stimulation and wild-type worms versus mechanosensory mutants), a 2 x 2 ANOVA is used to establish whether a significant interaction exists between the two categories. Post hoc t-tests with Bonferroni corrections are then used to compare within each category. Alternatively, reversing rate values are normalized by the average reversing rate without any stimulation for each experiment day and a t-test is used to compare between experimental conditions (e.g., wild-type versus mechanosensory mutants). Examples of raw data can be found in http://journals.plos.org/plosbiology/article?id=10.1371%2Fjournal.pbio.1002348#pbio.1002348.s001, which is a supplement to our original research paper (Rabinowitch et al., 2016). C. elegans behavior varies considerably as a function of its environmental conditions. We noticed that reversing rate might change dramatically from day to day. A key parameter affecting reversing rate was the dryness of the test plate. There was also differential variability in reversing between the mechanosensory mutants and wild-type worms. Here a key factor was temperature. In order to overcome this variation and cancel out its effects, each experiment is spread out over several testing days. Prepare a bottle of 500 ml LB (according to product recipe). Inoculate the LB with a single colony of OP50. Close lid loosely and place in a 37 °C incubator. Grow overnight without shaking and the next day place in a 4 °C refrigerator. Mix well: 72 g Bacto agar; 10 g Bacto peptone and 12 g NaCl in 4 L glass flask. Add 3.8 L H2O. Place stir bar inside flask and autoclave for 60 min. Right after autoclave add: 4 ml 1 M MgSO4, 100 ml 1 M K-phosphate buffer, pH 6.0 and 4 ml 5 mg/ml cholesterol. Place flask in 55 °C and stir. After media has cooled, add 4 ml 1 M CaCl2. While still warm pour 10 ml in each 6-cm plate. Guo, Z. V., Hart, A. C. and Ramanathan, S. (2009). Optical interrogation of neural circuits in Caenorhabditis elegans. Nat Methods 6(12): 891-896. Kocabas, A., Shen, C. H., Guo, Z. V. and Ramanathan, S. (2012). Controlling interneuron activity in Caenorhabditis elegans to evoke chemotactic behaviour. Nature 490(7419): 273-277. Leifer, A. M., Fang-Yen, C., Gershow, M., Alkema, M. J. and Samuel, A. D. (2011). Optogenetic manipulation of neural activity in freely moving Caenorhabditis elegans. Nat Methods 8(2): 147-152. Lindsay, T. H., Thiele, T. R. and Lockery, S. R. (2011). Optogenetic analysis of synaptic transmission in the central nervous system of the nematode Caenorhabditis elegans. Nat Commun 2: 306. Nagel, G., Brauner, M., Liewald, J. F., Adeishvili, N., Bamberg, E. and Gottschalk, A. (2005). Light activation of channelrhodopsin-2 in excitable cells of Caenorhabditis elegans triggers rapid behavioral responses. Curr Biol 15(24): 2279-2284. Rabinowitch, I., Laurent, P., Zhao, B., Walker, D., Beets, I., Schoofs, L., Bai, J., Schafer, W. R. and Treinin, M. (2016). Neuropeptide-driven cross-modal plasticity following sensory loss in Caenorhabditis elegans. PLoS Biol 14(1): e1002348. Stirman, J. N., Crane, M. M., Husson, S. J., Wabnig, S., Schultheis, C., Gottschalk, A. and Lu, H. (2011). Real-time multimodal optical control of neurons and muscles in freely behaving Caenorhabditis elegans. Nat Methods 8(2): 153-158. Tsalik, E. L. and Hobert, O. (2003). Functional mapping of neurons that control locomotory behavior in Caenorhabditis elegans. J Neurobiol 56: 178-197. How to cite: Rabinowitch, I., Treinin, M. and Bai, J. (2016). Artificial Optogenetic TRN Stimulation of C. elegans. Bio-protocol 6(20): e1966. DOI: 10.21769/BioProtoc.1966.